I haven’t been able to write about my father’s passing until now, as it’s been such a gut-wrenching personal loss for me and for his beloved homeland. But I felt on this Veterans Day weekend it was important to honor my dad, as his sheer survival exemplifies what it truly means to be an American and reveals the unwavering determination the human spirit has to prevail in the most dire of circumstances. As the embassy dignitaries solemnly approached me to officially present my father’s medal, my eyes immediately filled with tears. They caringly placed one of his country’s highest honors, a beautiful gold Maltese Cross enameled in white, into the palm of my shaking hand. It was a profound and overwhelming moment that was — literally — decades in the making. I slowly walked over to my father’s oak casket and gently placed the medal onto the flag that draped his coffin and likewise commemorated his courage, my hand lingering a moment as if to touch his heart one last time. The color guard raised their sabers in a dramatic salute as a sign of respect for the historic moment: My father had finally earned the recognition he deserved for the heroism he had exemplified almost seventy years earlier when he had nearly died fighting for the freedom of his country. The long journey to this moment had begun when my father had desperately crawled through the dark and corpse-filled sewers of Warsaw, and had continued in a brutal Nazi POW camp, where my father, Ryszard Kossobudzki, sold the suit off his back for a loaf of bread. At just thirteen years of age, he saw the German planes invade and decimate his country in September of 1939. Life changed forever in Poland, but my father’s steadfast patriotism did not. Although he was offered a chance to sneak out across the border after the fighting began, he did not leave. Instead, he voluntarily chose to stay and fight in the Warsaw Uprising of World War II, knowing the heavy odds were that he would die for his country. More than eighty percent of his citizen unit, virtually unarmed soldiers, did. Young Kossobudzki was known by his comrades only by a code name which, when translated, meant “Mountain Lion.” He had chosen that name to remind himself that he had to run fast and sneak by the Nazis. And, like a cat, he had many lives, narrowly cheating death over and over. He was shot at, torn up by grenade shrapnel, and chased by a dive bomber which obliterated the building he ran to. But eventually he was seriously injured by a mortar shell that killed his comrade who was standing just a few feet away. When he left Warsaw in October 1944, the once vibrant city was smoldering rubble, by some estimates, a staggering eighty-five percent destroyed. The young freedom fighter was held at gunpoint by the Nazis as they threw his near lifeless and bloodstained body onto a boxcar headed toward a German POW camp. As every bump of the steam locomotive made him wince in pain, all that mattered to this stalwart resistance warrior was to make sure he and his buddies made it through the next hour or day. Amazingly, it was around this time that he was nominated by his Commander for the esteemed Fighter’s Cross, the equivalent of the American Silver Star (something I discovered just a few years ago while researching and writing Quiet Hero, the bestselling book about my father). Ultimately, a daring escape from the POW camp led him to the safety of U.S. troops, who met my father — now weighing a mere ninety pounds on his six foot frame — with cheers and hugs on a small German riverbed. It was young American GIs who saved my father and told him he was finally free. My dad faced his final battle in life with the same courage, grace, and dignity that he had displayed as a teen. When he shared with me recently that he had cancer, my heart broke. Hearing the fear and pain in my voice, he said to me, “Don’t worry — in the Uprising, five German units couldn’t get me, I’ll fight this with everything I have, too.” And he did. He had choked up when I told him the Polish Consulate had learned, through documents that were hidden during the war, that he had been nominated in 1944 for the prestigious Fighter’s Cross. He humbly said all he cared about at the time was “not to have a wooden cross,” meaning killed in battle. Like so many veterans, he didn’t seek awards or accolades, he only cared about protecting his country and survival. Despite his incredible humility, I privately began diligently working on getting him the acknowledgements he greatly deserved. I felt it would not only recognize my father, but all of the unsung heroes of WWII. Knowing time was of the essence, I remained determined and made a trip to Poland to press forward on this important process for my dad. Appropriately, on Memorial Day weekend this year, a Polish embassy official and the Defense Attaché came to my father’s hospital bed in the ICU unit and formally presented him with a beautiful gold medal from the Defense Minister. As they pinned that medal and the Fighter’s Cross on my father’s hospital gown, even the critical care nurses and doctors who bore witness to emotional leavenings on a daily basis, were misty-eyed. To the sound of their applause, my father also officially became an officer, promoted from Corporal to Second Lieutenant. The uniformed general gave him a hearty salute. I was so thankful my dad was alive to see those great honors. As my father took his last breaths, I promised him I would always remind people of the extraordinary sacrifice of his fearless young Polish comrades and the brave U.S. troops who saved him and — I believe — saved the world in WWII, and continue to do that time and time again. I also told him how much I loved him and would miss him. As my father quietly slipped away, he was not only surrounded by accolades from America and his homeland, but by those who loved him dearly, holding his hand as the heroic Lieutenant Kossobudzki completed his last mission. 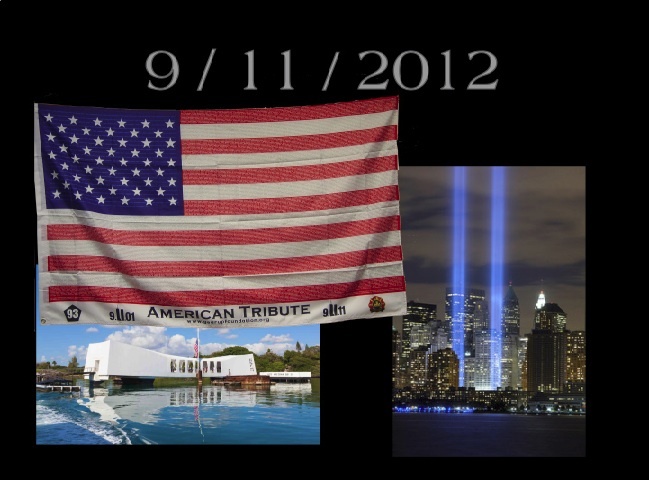 Today, September 11th, 2012, at 6:00 a.m. I had a very rare and distinct honor. I was asked to be a part of a very special sunrise tribute at Ground Zero to those who fell on 9/11/2001 and to those who continue to die from the illnesses inflicted on them during their selfless acts of rescue and recovery. It was a small gathering of fire fighters, veterans and first responders who embarked on a very special mission on this very special day. Starting at dawn’s early light, twenty flags bearing the names of those who died, and the first responders who sacrificed their lives, were consecrated at the base of the new World Trade Center. Then this small entourage headed for a waiting plane at JFK. In 10 and half hours they will land in Oahu, Hawaii and at 6 p.m. local Hawaiian time they will again consecrate those flags at a sunset ceremony at Pearl Harbor. On both days, 12/7/1941 and 9/11/2001 there were acts of bravery, humanity and selflessness, known and never to be known, performed by military, first-responders and civilians alike, against a backdrop of fire, smoke, death and destruction. Through those dark clouds over Pearl Harbor and the choking dust in lower Manhattan, the silver lining of the human spirit, and the uniquely American glow surrounding it, is what we paid tribute to from today’s sunrise to sunset. This event was organized by the Gear Up Foundation, itself born on the pile at Ground Zero and dedicated to helping those who served there as well as spreading American good will around the world, one fire company at a time. They accomplish this with their programs that recycle surplus fire trucks, firefighting equipment and instruction from America to other places in the world where it is sorely needed. When you stand at Ground Zero, or The Arizona Memorial at Pearl, on any day, but more so on this day, the spirit of the thousands who perished here overcomes you. The echoes of the bombs and torpedoes and the reverberation of collapsing buildings surround you. Yet at the same time, the rise of the human spirit, displayed on these days, energizes you. It’s cliché, but America’s worst days, brought out the best of the American spirit.